Hearkening to a more decadent and regal era, this Roman chandelier has all the grace and romance of an accent befitting an elegant villa. 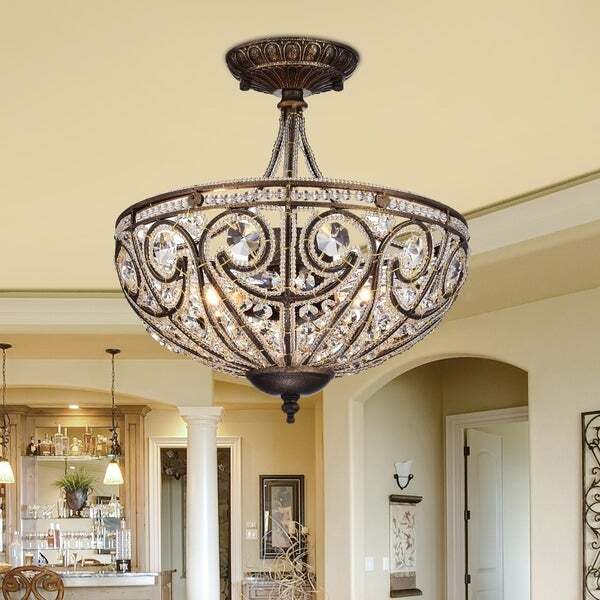 Make your home your castle with this wonderfully glamorous lighting fixture. The stately warmth of antique bronze juxtaposes magnificently with shimmering crystals that catch the light and sent it scattering over the room in splendorous luminosity. Note: This disclaimer does not apply to floor and table lamps. The picture does not do it justice. It is in my dining room in a vintage 1920's remodeled home and looks gorgeous. Love it! I have a room as you walk in the front door that has a baby grand piano. The room is antique and modern. This light was perfect for the feel that I wanted for the room. I love the quality. It is beautiful on or off. I highly recommend this chandelier. Very happy with my Drake Modern Roman Chandelier. I highly recommend it. This chandelier is on the smaller side, but casts enough light for a small dining area. Gorgeous design, comes with the crystals attached right out of the box. Very simple to install. This fixture is absolutely beautiful. Very easy to install and adds just the right amount of bling. We installed two of them in the long entry hall way and it makes quite a statement. I highly recommend this fixture. Although quite smaller than I thought, I absolutely love the design of it. Very stylish! However it’s very frustrating that the instructions did not include the size of bulb needed therefore I had to go back and forth to the store to figure out the proper size. 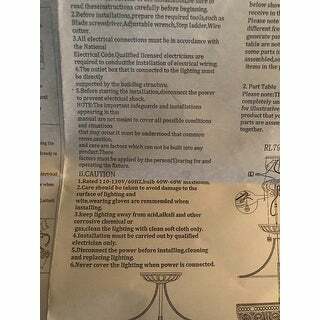 There’s a diagram of it but it doesn’t says what bulb fits. I love this fixture. The look is very classy but subtle. The light bulbs are a bit of a pain to get to because the fixture portion is not easily removed. The plastic makes for easy cleaning. I haven't tried but when I looked at this, the fixture seems not very intuitive to remove cover for easy bulb change. I love this light fixture. It’s so elegant and beautiful. 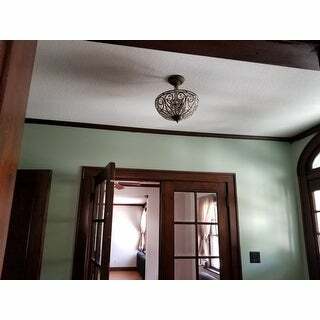 This Chandelier looks beautiful in my dining room with solid oak trim. It is a little small for the room, but personally I like that because it makes the room appear larger. My father is an electrician and installed this easily. Because of the direction of the sockets it was a little tricky for me to get the chandelier lightbulbs screwed in but my husband was able to get them in just fine. We used LED’s so they will not have to be changed for a long time. It puts out a lot of light and I have it on a dimmer which is nice as well. Bought this for my staircase light. I absolutely love it in fact I bought 2 of them. The gold wire that ties the 'chrystals' and beads to the frame stands out and looks cheap. It isn't as neatly done as the picture implies. 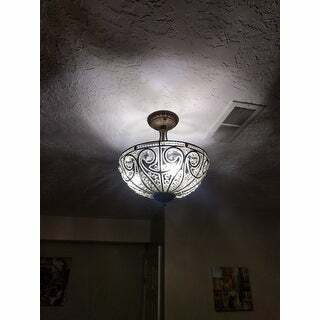 love this Chandelier would recommend it to anyone please let me know when it goes on sale I would like to buy another one. Just the right size for a medium sized foyer. Gorgeous! Very beautiful and elegant light fixture. Strongly recommend. It is beautiful!!! I Love it!!! I would recommend!!! Great addition to our home. Such a wonderful piece. Would definitely shop this line again. Great and fast shipping from over stock. Couldn’t ask for better service. 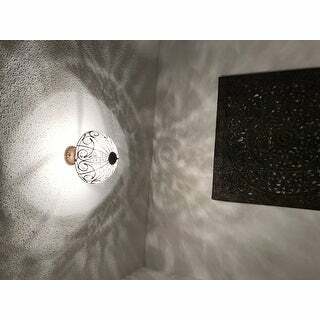 Gorgeous semi flush ceiling light. My client loves it. It is the perfect size for their master bathroom water closet. Highly recommend this quality product. 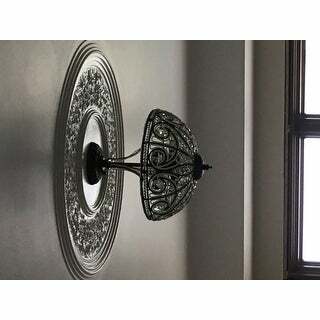 "I ordered this light and absolutely love it but I cannot use it on vaulted ceiling, is there a way to change the base? " 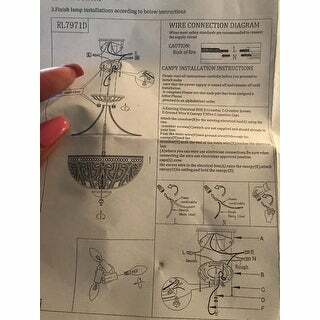 "Please refer me to item number for mini pendant lights that go with this chandelier. Thanks "
"Can someone share what kind of bulb is needed? I m having a hard time finding the right size"
"Will you be getting this chandelier in again. " "What is the diameter of the circular base that mounts to the ceiling? " "Are the 14 inches dimensions from ceiling mount to bottom of fixture?" "Is it difficult to change the bulbs in this chandelier and is it easy to clean? Thank you "